Adam Scott of Fife AC and Central AC’s Kate Gallagher claimed the Scottish U17 Road Races titles on Saturday to again demonstrate their potential. 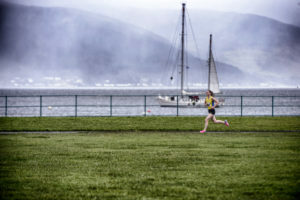 Heavy showers didn’t dampen the spirits at Battery Park, Greenock, as clubs from across the country gathered for races at U17, U15 and U13 level. It was a particularly good day for those who had made long trips from the North – with individual medals for the likes of Inverness Harriers, Moray Road Runners and East Sutherland AC. 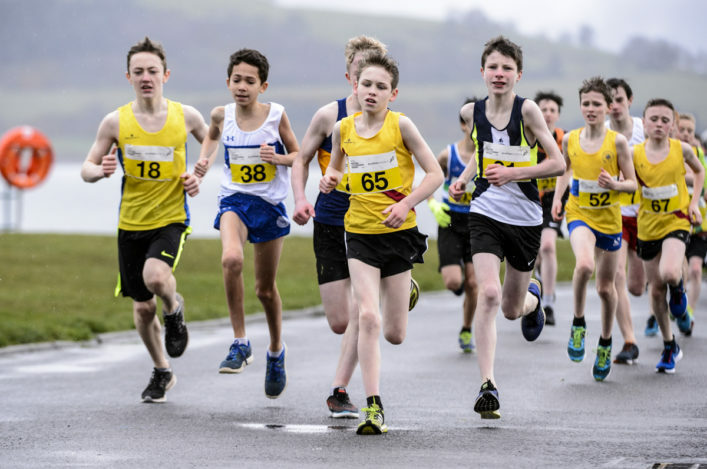 Giffnock North AAC and Kilbarchan invariably impress at this event and they picked up a number of sets of team medals but it was also great to see the likes of Garscube and Cumbernauld on the podium and Falkirk Vics collect a couple of individual medals. Indeed, Lucas Cairns from Inverness took gold in the U13 Boys race with Katie Johnson of Edinburgh AC the U13 Girls champion. 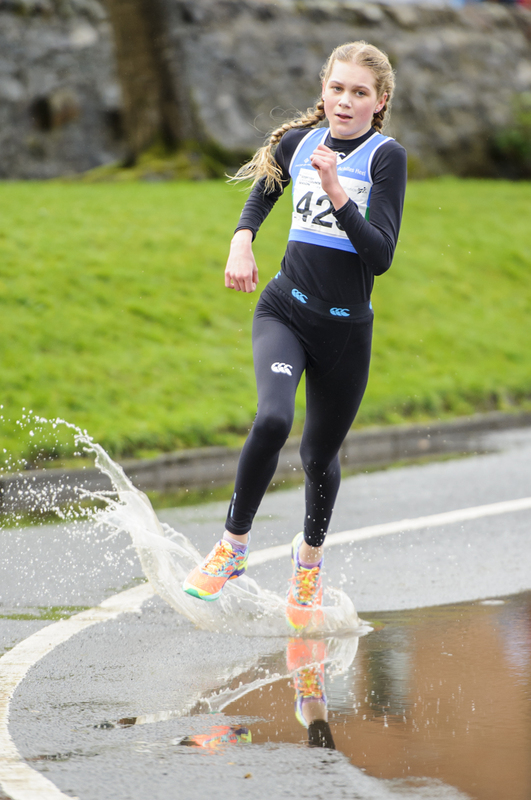 In the U15 races, Hamish Armitt of Giffnock North AAC and Lily-Jane Evans-Haggerty of VP-Glasgow have been in superb form all winter at this age group and they maintained that dominance with gold medal-winning performances. Gallagher took the U17 Women’s race, as she won it from Jessica Christie of Falkirk Vics and the far-travelled Constance Nankivell of East Sutherland. ‘I’ve won track golds before but never a National title on the road or in cross country,’ said Gallagher, who is part of Derek Easton’s training group at Central AC. ‘Kate is doing well. 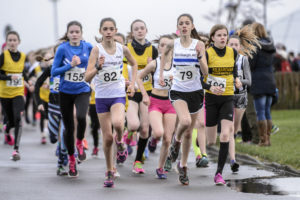 She is part of a large training group and that includes Andy Butchart, when he is around in Scotland, and hopefully they all feed off each other,’ said coach Derek. ‘There are around 30 women in all there and she’s working hard and learning from the likes of Morag MacLarty, Jenn Wetton and Lindsay Morrison. ‘I think it is really important for young athletes to see a successful Senior side to their club and to have joining that as one of their goals. For Nankivell it was a well-earned bronze after a lengthy trip. ‘The club is based in Tain so we made a long journey down after Constance finished school on Friday afternoon,’ said her mum, Rebecca. 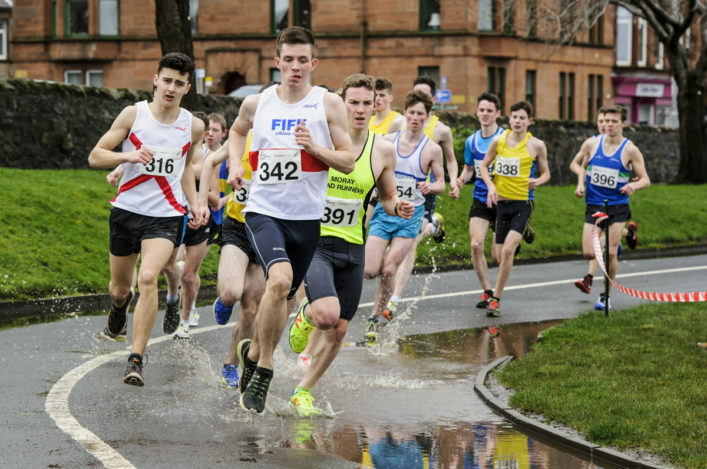 Scott has the Bahamas on his mind with a potential Commonwealth Youth Games appearance for Scotland on the track looming this summer but he was just as commanding on the wet concrete at Greenock to win in 15.08. 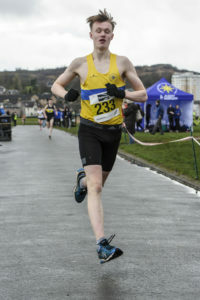 VP-Glasgow’s Robbie Smith was second and Cameron Main of Moray Road Runners took the bronze. The team title went to Kilbarchan with the other medallists being Gala and event hosts Inverclyde AC. Giffnock North won the U17 Women’s team golds. 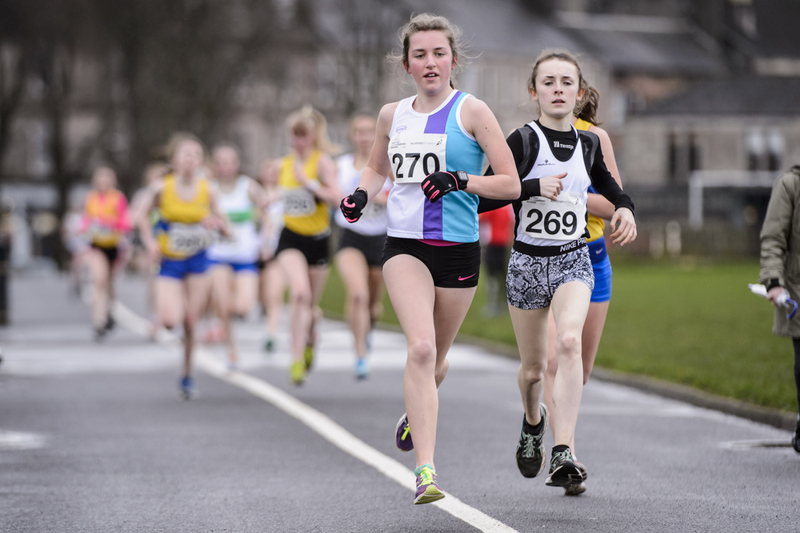 Evans-Haggerty won the U15 Girls gold from Cera Gemmell of Team East Lothian with Heather Barnes of Giffnock North in third. Giffnock won the team title from VP-Glasgow and Edinburgh AC. Armitt powered ahead of Kane Elliott of Falkirk Vics and Elliot Duff of Garscube Harriers. The team golds went to Giffnock as they won from Garscube and Cumbernauld AAC. Edinburgh AC took the U13 Girls team golds and that was no surprise as Katie Johnson and Emma Johnson were placed first and third. Mia Linklater of Corstorphine AAC took the silver medal; the team silvers went to VP-Glasgow with Giffnock North taking the bronzes. Inverness Harriers won the U13s title at the National XC and they made it a double in Greenock with Cairns taking the gold from Gregor Campbell of Shettleston and Connor Gourley of Pitreavie AAC. 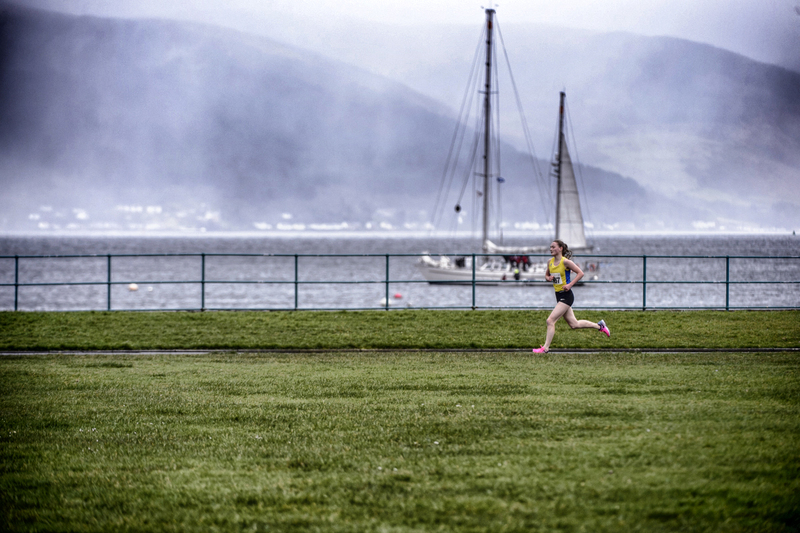 In the team race, VP-Glasgow were second and Giffnock took the bronzes (on countback from East Kilbride AC).